City Hall Plaza is keeping the party going well past the holidays at Boston Seasons, its year-round programming at Government Center. While the European-inspired holiday markets are packed away until next year, they have been replaced with an “Uber Lodge,” a heated hospitality area home to Wachusett Brewing Company’s Boston Brew Yard. Warm up with your friends and a brew, enjoy some food, and take in live entertainment and the playoffs from two large televisions sponsored by Xfinity. 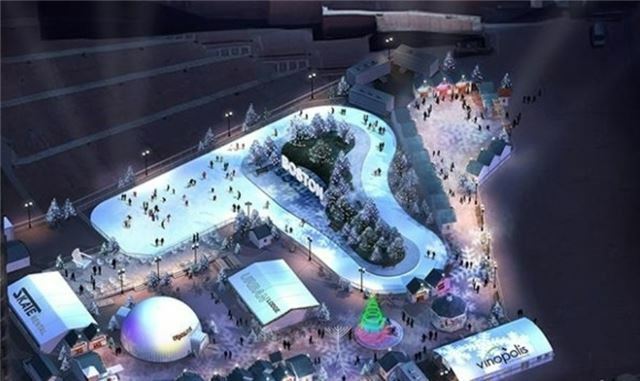 The outdoor Skating Path offers learn-to-skate programs as well as skate rentals and themed nights, and don’t forget to whizz past the iconic “BOSTON” sign while channeling your inner Nancy Kerrigan. Boston Winter will also have a rotating schedule of food trucks ready to fill your cravings that result from the on-ice cardio. Vendors are selected to give visitors an authentic taste of Boston that also pairs with the brews poured inside from Wachusett Brewing Company.